Opening comments: I wrote this piece a while back and it's now gotten a second life with the recent interview for the NBC article: Here's a career tip: Leave mom and dad at home. I appreciate Alison's +Allison Linn perspective as she writes it from the view of the young adult and boundaries with parents. Apparently it won't die as I did similar interviews a year ago for 2 HR publications. Thanks Howard - perfect illustration! I'm not going to make any assumptions as I start this post. 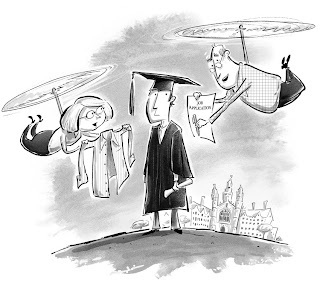 Have you ever heard of a 'helicopter parent"? If not, here's what it is -- it's a parent who attempts to run a child's life into adulthood. In their sincere desire to help, they do not give their children a chance to "do on their own". As I've traveled across the country conducting professional development seminars, I have heard many a helicopter story from HR professionals -- some to the point of absurdity! So how do you as an HR professional handle it? Do you have any policies or philosophies in place? I was interviewed on this topic, the results of which appeared in 2 different HR publications. I am posting the main link first because it has many comments. If you know of one - please share this article and ask them to pay particular attention to the subsequent comments! They need to know!